Impetigo is a contagious skin infection that most commonly affect children. It can develop if bacteria get into healthy skin or into minor cuts, scrapes, or skin where the barrier is impaired such as in eczema or insect bites. Impetigo is usually caused by a bacterium called “Staphylococcus aureus,” a type of “staph” infection. Less commonly, the infection is caused by either another bacterium called Streptococcus pyogenes,” or by both bacteria. 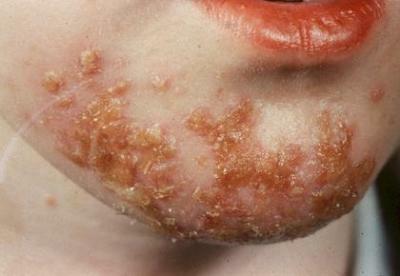 Impetigo causes red bumps on the skin, usually on the face, arms, or legs. These bumps eventually form blisters that then burst and scab over with a distinctive yellow, gold, or brown crust. It can also look like larger blisters or even remain as open sores. The most important thing to know about impetigo is that it is extremely infectious! The team of dermatologists at Atlantic Dermatology and Laser will assist by teaching parents to gently cleanse the crusts off and prescribe either topical or oral antibiotics as well as spend the time to educate about colonisation with Staphylococcus aureus and how to eradicate it.